Product #18325 | SKU VL-4SI | 0.0 (no ratings yet) Thanks for your rating! The IDX VL-4SI is a four-channel, simultaneous Li-Ion (Lithium-Ion) fast charger. Up to four Li-Ion Endura V-mount batteries can be charged in 2.5 hours or less. This model features an LCD readout and PC information retrieval capabilities. The VL-4SI offers a lightweight design (7.1lbs) with a convenient built-in handle. As Li-Ion is memory free, batteries can be charged from any state regardless of the batteries charge status. Each IDX Li-Ion battery has its own built-in microprocessor which enables direct communication with the chargers program to individually select for each battery the correct charge program specific for that battery. This model comes with an LCD status readout. Via a USB port, this device will allow information retrieval from a PC. 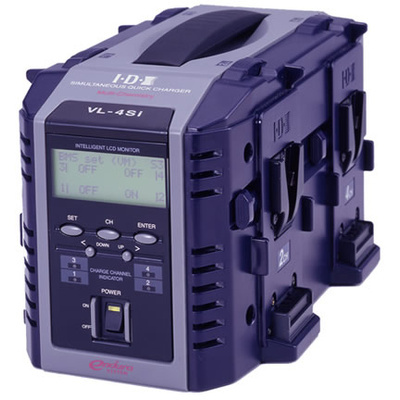 As with all IDX chargers, the VL-4S's power switch is recessed to prevent an accidental loss of power. A world-wide, auto-sensing AC power (AC 100-240V) operation is standard. 6.14 x 11.34 x 6.02"